I have been trying very hard to make my home more of a "home" and less of a transition. All the while trying to stay within a modest budget. This entails much thought, research and dwelling. I dwell so much my head hurts. I think of an idea and I mull it over and over and over and still feel as if I need 1 or 100 opinions. Sadly enough, I have been turning to Mr. French in times such as this. Foolishly thinking his opinion would really be helpful. It's not. He is sick of me asking and I am sick of him blowing it off. In order to save my marriage I need to stop asking him...seriously. Which is why I turn to you! I have been shocked and delighted by the level of creativity, beauty, and amount of taste I have stumbled onto in the blogging world. I can't believe it has taken me so long to tap my most amazing resource. Here is my latest fleating idea. 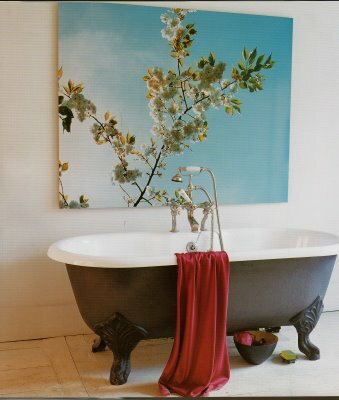 I want to spiffy up my dark tiny dining room and something like this is what I have come up with (not the tub, the larger than life photo). I am currently stuck for 2 reasons. First I am not sure where to go (hopefully online) to create this type of thing. I don't think I want canvas...I want smoother than that. However, it has to have a bit of thickness to it because I don't want to frame it. Maybe about 1/4-1/2 inch thick? Ok here is the second issue: Which photo? These are my current candidates (below each photo is a number). I would be over the moon thrilled if you would leave a comment giving me your choice and/or advice. Oh and the room is a very pale blue...but no windows and quite dark.